If you go to the gallery page, you see most of my past attempts at trying to prefect what I thought would be the be perfect eDrum set. Set numbers 4a, 4b, & 5 use an aluminum shell hoop that I rolled myself. I knew when I did these that there were few, if any, eDrum DIY’er who attempted this. Unfortunately, I had to sell eDrum set #5. However I have one of the eDrum triggers from that set. I currently use this trigger as my bass drum trigger in set #6 (which at the time of writing this, I do not have pictured). Set #6 is an acoustic conversion. 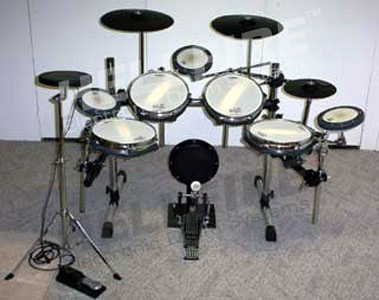 I happened upon your Hellfire Edrums site while browsing the Vdrums.com forums and I have to say, your designs are quite impressive. I am just getting back into drumming after about a 20 year hiatus and thinking about putting together a DIY edrum kit for myself. At first I was considering going the route of the REMO practice pad conversion but after seeing your designs, I think I may try out some of your ideas. I have access to a complete, professional machine shop with a very experienced machinists who has offered to help build the drum triggers. He has been pushing for a the “bend a piece of aluminum into a hoop” concept for the past 6 months or so to me but wasn’t convinced that it would work. Apparently, it does based on what I see you were able to achieve. I look forward to seeing more of your posts showing the rest of the design. 1. Have you made any dual-trigger pads using your concept (ie. for a snare drum)? 2. Do you have any closeup pictures of how you joined the ends of the hoop together? Did you taper the ends so you get a near seamless joint or did you just overlap the ends and rivet them together? Do you round/smooth the top of the hoop? 3. I didn’t see the foam used for the sensor listed in your parts list. Did I miss something? Let me quickly answer Dan’s questions, and then I invite you to look at the pictures for a little more detail on how the hoops/set #5 was constructed. 1) I have made dual trigger pads before, but I have not made a dual trigger pad using the aluminum hoop shell design. However, it would not be that difficult to do. 2) See the closeup below. Hopefully these will answer your questions. 3) The parts list that is listed, is for my new X4L eDrum design (it is basically an updated version of eDrum set #5, but a lot better!). I do not have the foam listed, because at the time I did the list, I did not have the testing done for the foam design I’m working on.